According to a report from Korea, Samsung is considering developing Quantum-Dot displays (QLEDs) for TV panels that will compete with OLED TVs. 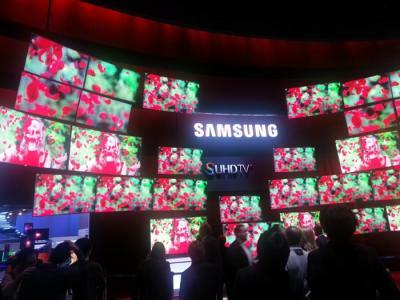 Samsung has failed to commercialize large-sized OLEDs using its direct-emission architecture, and reportedly believes it will fair better with quantum-dot displays. Samsung is already producing LCD TVs enhanced with quantum-dots films that enhance the color gamut - but these aren't QLED TVs. A QLED is similar to an OLED - an emissive display that uses the QDs as light emitting materials. Samsung has been developing QLEDs for a long time - and in 2011 they presented a prototype full-color display. But the technology proved to be difficult to develop further and was reportedly abandoned by most major players (LG also wanted to develop QLEDs back in 2010). Digitimes now says that Samsung has been in fact developing this technology since 2011, and has recently made some breakthroughs. According to the new report, Samsung plans to commercialize this new technology by 2020. I cannot believe personally that Samsung will let LG (and other players) take over the OLED TV market until QLEDs are ready 2020. OLEDs has many advantages over LCDs (check this recent LG 0.97 mm thick prototype, for example) and once LG's capacity increases and prices drop, it's likely that OLEDs will take over the entire premium display market - together with its high profit margins. Is each QLED subpixel an independent light emitter? Does this mean that each QLED subpixel will be an independent light emitter? Not holding my breath on this one. QDvision was (has been?) working with LGD on EL from QD. Not sure where they are now. QDs need organic surfactants to make them soluble. They are also susceptible from high energy, blue excitons. Yes. Each QLED subpixel will be its own light emitter in an RGB configuration. The choice of subpixel rendering is identical to OLED subpixels.